This post is a result of my son Daniel's 8th grade science lesson on "light" in December of 2005 during the season of light as shown by the story and history of the Maccabees. So, to set the stage, first let's see what some of the Scriptures have to say about light. Psalms 119:105-112 NUN. Thy word [is] a lamp unto my feet, and a light unto my path. I have sworn, and I will perform [it], that I will keep thy righteous judgments. I am afflicted very much: quicken me, O LORD, according unto thy word. Accept, I beseech thee, the freewill offerings of my mouth, O LORD, and teach me thy judgments. My soul [is] continually in my hand: yet do I not forget thy law. The wicked have laid a snare for me: yet I erred not from thy precepts. Thy testimonies have I taken as an heritage for ever: for they [are] the rejoicing of my heart. I have inclined mine heart to perform thy statutes alway, [even unto] the end. Genesis 1:3-4 And God said, Let there be light: and there was light. And God saw the light, that [it was] good: and God divided the light from the darkness. In this verses from Genesis the Hebrew word for light is 'owr, it is written with the letters Aleph Vav Resh. The meaning of the letters are "Strength", "Connection" and "Beginning". This "light" is different in the Hebrew text and its meaning differs from the word we simply translate as "light" in Genesis 1:16. There the Hebrew word for light is ma'owr. Everyone knows that darkness is the absence of light. Most know that the human eye is sensitive to light and able to detect only a small region of the sun's electromagnetic spectrum known as "visible light". If you just stop and think about our eyes for a moment you will realize that they are powered by the electrical nervous system of our bodies and the electrical bandwidth if you will, that powers our vision is a mere 2-3 electron volts. To compare, an X-ray machine a high voltage DC power supply capable of producing in excess of 40,000 volts because X-rays are created when electrons are accelerated at high speed and that requires some high voltage. But visible range of 400-700 (nm) can be considered interesting numbers from a Biblically Hebraic perspective! Why? Just like a computer code, each Hebrew letter has a numeric value, and each Hebrew letter has a meaning. The numerical valuation is known as Gematria. The value of the Hebrew letter Aleph, the first letter is one. The last letter, Tav is four hundred. Tav ת is the Hebrew letter which means "covenant" and it is the sign of a cross. Often given an independent final value of 700 is the Hebrew "final" Nun ן the Hebrew letter which means a continuation of new life. "Visible light" corresponds to a wavelength range that we measure as 400 - 700 nanometers. Admittedly, a nanometer is merely a unit of measurement, but the interesting thing that my son Daniel and I have realized is that the cross (400) represents life (700). "TAV. Let my cry come near before thee, O LORD: give me understanding according to thy word. Let my supplication come before thee: deliver me according to thy word. My lips shall utter praise, when thou hast taught me thy statutes. My tongue shall speak of thy word: for all thy commandments [are] righteousness. Let thine hand help me; for I have chosen thy precepts. I have longed for thy salvation, O LORD; and thy law [is] my delight. Let my soul live, and it shall praise thee; and let thy judgments help me. I have gone astray like a lost sheep; seek thy servant; for I do not forget thy commandments. The Sabbath explains the number 1/7. The Sabbath is one day of the seven days of the week established at cration and 1/7 as an infinite sum of the digits 0.142857. The six repeating digits of 1/7 is a cyclic number, an integer in which cyclic permutations of the digits are successive multiples of the number. Each week repeats. Each of the 7 moedim of YHVH repeats, the 7 years of the sabbatical cycle repeats. Notice that a cyclic number with n digits, when multiplied by 1, 2, 3, ..., n produces the same digits in a different order. For example, 142857 is a cyclic number: 142857 × 2 = 285714; 142857 × 3 = 428571; 142857 × 4 = 571428; 142857 × 5 = 714285; 142857 × 6 = 857142, and so on. It has been conjectured, but not yet proven, that an infinite number of cyclic numbers exist. Our infinite God chose the number 7 at creation for a reason. Yet this "spectrum" comes from a trinity of three colors. The four other colors of the full spectrum come from these three, they are magenta, cyan and yellow. Bringing all six colors together as one produces the seventh which is pure - perfect white light. NASA tells us: "Each color has a different wavelength. Red has the longest wavelength and violet has the shortest wavelength. When all the waves are seen together, they make white light." In Hebrew white is "laban" לָבָן. Yes, white is the name of Jacob's father-in-law. He was the original Mr. White! Psalms 4:6 [There be] many that say, Who will shew us [any] good? LORD, lift thou up the light of thy countenance upon us. John 1:7 The same came for a witness, to bear witness of the Light, that all [men] through him might believe. 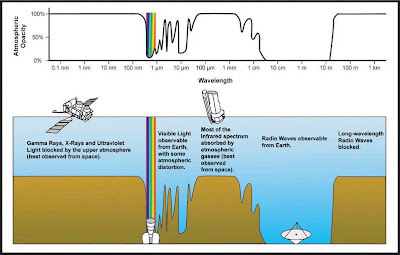 Light consists of the entire electromagnetic spectrum including, you may have guessed it, seven (7) wavelengths: 1) gamma rays, 2) X rays, 3) ultraviolet radiation, 4) visible light 5) infrared radiation, 6) microwaves and 7) radio waves. The difference in these light forms is simply the length of their waves. Check out this NASA website if you'd like to determine the length of different radio waves. So too, our Creator gave us a "spectrum" of His seven appointed Feast days which show us the plan of His salvation through the Feasts, His scheduled appointments with mankind. Likewise His seven spirits are described and prophesied by Isaiah to be resting upon the Messiah, our savior. These are described by John in Revelation as a representation of the seven branched menorah, the seven "lamps of fire" which are powered by oil unrepresentative of the Holy Spirit of our God! Revelation 4:5 And out of the throne proceeded lightnings and thunderings and voices: and [there were] seven lamps of fire burning before the throne, which are the seven Spirits of God. Revelation 4: 2- 5 And immediately I was in the spirit: and, behold, a throne was set in heaven, and [one] sat on the throne. And he that sat was to look upon like a jasper and a sardine stone: and [there was] a rainbow round about the throne, in sight like unto an emerald. And round about the throne [were] four and twenty seats: and upon the seats I saw four and twenty elders sitting, clothed in white raiment; and they had on their heads crowns of gold. And out of the throne proceeded lightnings and thunderings and voices: and [there were] seven lamps of fire burning before the throne, which are the seven Spirits of God. Color is important and the Bible, the white light of His Word is full of it. White represents hearing and doing all of God's word. That's what the priestly duty of wearing a white garment is all about. The priest was not sitting around in a pew only hearing the word, nor standing in a pulpit telling the word. No, the priest was busy doing the words of God's instruction. This is what James 1:22 speaks to. Exodus 25:31-35 And thou shalt make a candlestick [of] pure gold: [of] beaten work shall the candlestick be made: his shaft, and his branches, his bowls, his knops, and his flowers, shall be of the same. And six branches shall come out of the sides of it; three branches of the candlestick out of the one side, and three branches of the candlestick out of the other side: Three bowls made like unto almonds, [with] a knop and a flower in one branch; and three bowls made like almonds in the other branch, [with] a knop and a flower: so in the six branches that come out of the candlestick. And in the candlestick [shall be] four bowls made like unto almonds, [with] their knops and their flowers. And [there shall be] a knop under two branches of the same, and a knop under two branches of the same, and a knop under two branches of the same, according to the six branches that proceed out of the candlestick. Messiah is seen in the design of the pure gold menorah, with its candlestick in the center and the three branches on both sides of course equal seven. With the design of the menorah as shown Moses and John 'the revelator', God is showing us a heavenly "shadow picture" of Himself as a visible representation on earth. Remember, the instruction of the tassels to be worn by everyone? The blue tread is to help us "remember" God's instruction. Moses was explicitly instructed by God to make everything including the menorah exactly as he was shown to do while on Mt. Sinai. Gold is immutable and represents the pure light and beauty of God's precious and unchanging words of instruction just as Hebrew 6:17-18 tells us. In this way, it is important to recognize that gold never tarnishes... nor does God's instruction ever fade. Gold does not corrode because gold does not gain or lose electrons. In the same way, God tells us do not add to or take away from His word (see Deuteronomy 4:2). Think about the Biblical instruction, it is repeated in Deuteronomy 12:32 - do not add to or take away from the word. The ark was made of pure gold, it held the 10 commandments. So, if we would just consider the meaning here, we might consider that "Gold reflects yellow and red, but not blue or blue-green. The direct transmission of light through a metal in the absence of reflection is observed only in rare instances." (Source: Causes of Color). IN fact, gold strongly reflects red. When you think about the role that red plays in the Passover account, that is significant. Walking in God's instruction is like walking on a street of gold. That is why the Bible symbolically shows us the golden streets in Revelation 21:21, and if we walk with the blue tassel, its reflection is not seen because the blue color is absorbed by the gold since it does not reflect light like a mirror. In this way they are one. Although gold is a heavy, dense metal, it is non-toxic. That is why gold metal leaf may be eaten in foods or drinks. Remember the 24 thrones of the elders described in Revelation 4:4? Well, 24 karat gold is pure elemental gold. Unlike other metals gold does not change. Gold is a noble metal and it is basically un-reactive and resists degradation by air, moisture or acidic conditions. Pure gold is odorless and tasteless. This makes sense, since the metal is un-reactive. 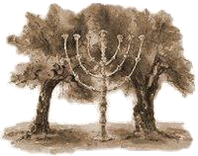 Take a look at the graphic above depicting Zachariah's vision which included the two trees, the two witnesses to God's word. We all know that a "rainbow" is an arc of colored light in the sky caused by refraction of the sun's light into the seven colors of the spectrum. The seven colors of the rainbow are the "basic spectrum" from which all light that we see is composed. Although these colors merge smoothly, they are divided into red, green, blue, orange, yellow, indigo and violet (and other names). Just as various musical sounds contain the tones of the basic scale (often combinations of tones, e.g. chords), all visible light is made up of its seven spectral color components and all music is made up of 7 basic notes. We call them A,B,C,D,E,F and G.
The Bible tells us that light and sound are linked at the creation and science proves this. Just as God gave us seven spectrum in light He gave us seven tones on the musical scale. God spoke creation as the commands of His voice resonated. "According to string theory, absolutely everything in the universe — all of the particles that make up matter and forces — is comprised of tiny vibrating fundamental strings. Moreover, every one of these strings is identical. The only difference between one string and another, whether it's a heavy particle that is part of an atom or a massless particle that carries light, is its resonant pattern, or how it vibrates." "What determines the type of particle is the movement of the string and the energy associated with this movement. According to Einstein's famous equation E=MC2, energy and mass are equivalent — that is, the more energy something contains, the more mass it has, and vice versa. In string theory, this equivalence accounts for the different masses of different particles: a lower-energy string is lighter (less massive) than a higher-energy string. Perhaps without ever realizing it Einstein's relativistic symmetries of space and time described by his E=MC2 special relativity space-time formula describes the greatest mystery of the Bible. The mystery of how God who is an unseen Spirit could become a man, how God and and the son are one, and how Jesus could be resurrected. Einstein taught Mass=Energy equivalence. The three part formula where E is energy, M is mass, and C is the speed of light squared. The fact that after resurrection, Jesus was able to physically appeared in the closed room with the disciples (Mark 16:14; Luke 24:33-37 and John 20:19) without the walls impeding Him is also explained by E=MC2 because as God He can engage E=MC2 which also provides that whenever any type of energy is removed from a system, the mass associated with the energy is also removed, and the system loses mass. But it is important to note that that no net mass or energy is really lost in this change state. Mass/energy simply moves from one place to another. "Are not the gross bodies and light convertible into one another, and may not bodies receive much of their activity from the particles of light which enter their composition?" 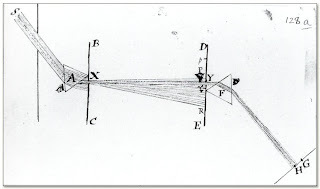 Newton also showed us another mystery, that not only can a three sided triangular prism separate a beam of sunlight into the seven colors, the frequencies of the rainbow, but also that when a second prism is used it brings the different colors together again and pure white light is once more obtained. Job 24:13 tells us: They are of those that rebel against the light; they know not the ways thereof, nor abide in the paths thereof. Remember, the colors in the visible wavelengths only consist of three primary colors: blue, green and red. All colors of light are brought forth by these three. Amazingly, our eye contains three kinds of light-sensitive cells, each sensing a different band of colors - one band centered in the red, one in the green and one in the blue. Consider in a similar way, that blue represents the spiritual heavenly realm of The Father, the green represents His bodily earthly life as Messiah, and the red represents Messiah Yeshua’s suffering, death and resurrection into new life. Blue is seen throughout Scripture as a tie to "doing" God's word. We see this in His instruction to wear the fringe, the tassels described in Numbers 15:38-39. Like a sting around our finger, the blue string of the tassel (tzitzit) is used by God as a simple physical reminder for us to show God that we love Him by walking in His teaching, following His eternal instruction for life. Three is the number of the harvest day of Passover, the day called First Fruits, a symbol of His resurrection. In creation, on the third day God created fruit - the harvest of food for life on earth. He created grass, the seed bearing herb's and He created the fruit bearing trees that give food and oxygen making life possible on planet Earth. The seven spectrum of light can be seen as integrated with the creation and design of our solar system. The Menorah, like the spectrum of light is a shadow picture of the visible solar system. We can "see" seven planets and the 3rd planet is the only one capable of sustaining life on it, it is our Earth. In a like manner, the Bible gives us the appointed "third" feast known as First Fruits, it is an impression that represents the white light of our Savior's resurrected life. It is the day of Messiah's resurrection. In fact, any color which we see, including brown, olive-green and all others are absent in the rainbow spectrum> They are an impression as our brain conveys these colors combining light wave signals from the three primary color bands. James Clerk Maxwell, the great Scottish physicist who it just so happens to have given the basic equations of electricity, (the man that predicted electromagnetic waves) taught that two kinds of color exist, depending on whether it was perceived by an instrument or by the human eye: 1) "Spectral color, " i.e. the three true colors of the rainbow and their seven spectral wavelengths as seen in the rainbow are 2) "Perceived color" by the human brain which mixes and changes true color. These two color types are two literal witnesses where truth is declared. Two witnesses are always required by Torah(see Deuteronomy 19:15). Today, we know that light is composed of photons which "display" two properties, those of a 1) wave and some of the properties of a 2) particle. Electromagnetic energy at a particular wavelength λ (in a vacuum) has two properties and an associated frequency ν and photon energy E.
"Maxwell made fundamental contributions to the development of thermodynamics. He was also a founder of the kinetic theory of gases. This theory provided the new subject of statistical physics, linking thermodynamics and mechanics, and is still widely used as a model for rarefied gases and plasmas. Maxwell's many interests included color. 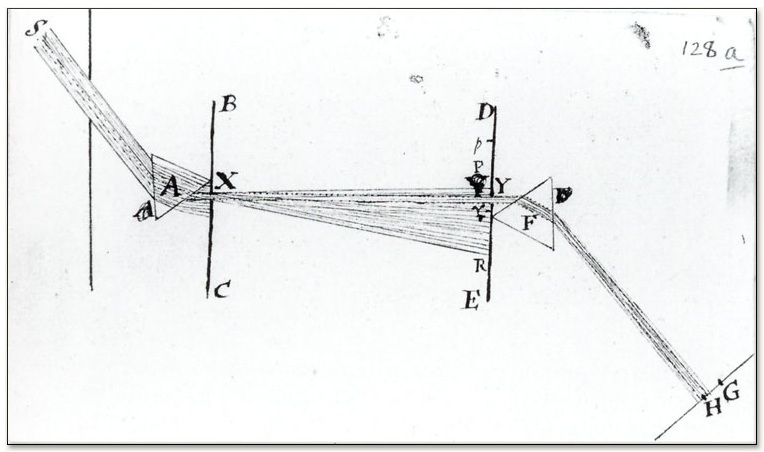 He analyzed the phenomenon of co lour perception, which led him to invent the trichromatic process. Using red, green and blue filters, he produced the first color photography - of a Scottish tartan ribbon. This process was the forerunner of today's modern color photography. Calculating the speed of electromagnetic waves, Maxwell postulated that light is a form of electromagnetic radiation exerting pressure and carrying momentum. This provided the basis for Einstein's work on relativity from which the relationship between energy, mass and velocity contributed to the theory underlying the development of atomic energy." Maxwell also demonstrated that electric and magnetic fields travel through space in the form of waves, and at the constant speed of light. Maxwell showed that light was a vibration in the electromagnetic field, and that it traveled at a constant speed, the speed of light. 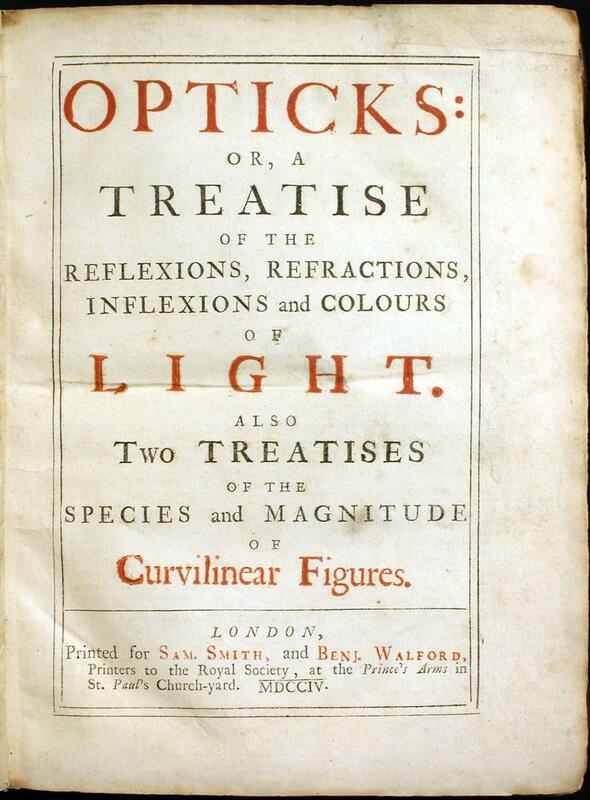 he stated: "We can scarcely avoid the conclusion that light consists in the transverse undulations of the same medium which is the cause of electric and magnetic phenomena." In his 1864 paper "A dynamical theory of the electromagnetic field", Maxwell wrote, "The agreement of the results seems to show that light and magnetism are affections of the same substance, and that light is an electromagnetic disturbance propagated through the field according to electromagnetic laws". Maxwell's equations demonstrate that the three fields of electricity, magnetism and light are all manifestations of the same phenomenon, namely the electromagnetic field. Zechariah 4:11-14 tell us: Then answered I, and said unto him, What [are] these two olive trees upon the right [side] of the candlestick (seven light menorah) and upon the left [side] thereof? And I answered again, and said unto him, What [be these] two olive branches which through the two golden pipes empty the golden [oil] out of themselves? And he answered me and said, Knowest thou not what these [be]? And I said, No, my lord. Then said he, These [are] the two anointed ones, that stand by the Lord of the whole earth. It just so happens, the word light occurs 272 times in Scripture. Yet three is important. The seven spirits may be expressed equally well in the manifestation of the terms of the unity of Father, Son and Spirit. Using Hebrew words we have 1) Father or Abba in Hebrew, the invisible One 2) Son of man, The Anointed One or Messiah which is God who became a man and 3) Spirit or in Hebrew, Ruach HaKodesh which to me is likened to His light, the essence of God. Light travels at the same speed, the constant speed of light is unchanging and eternal, it never stops traveling and and Einstein proved the speed of light is constant in an absolute space-time frame. Just as God exists outside the laws of time and space, time as we know it does not exist at the speed of light. The speed of light in a vacuum is defined to be approximately 186,282.397 miles per second, or 670,616,629.4 miles per hour. This value is also known as Einstein's constant. Like God, anything traveling at the speed of light does not change, it has no mass. The Physics Department at Boston University explains: "Einstein won the Nobel Prize for Physics not for his work on relativity, but for explaining the photoelectric effect. He proposed that light is made up of packets of energy called photons. Photons have no mass, but they have momentum and they have an energy..." Light is frozen in time, this all goes back to Einstein's theory of relativity, even back to a psalm of Moses, to the prophet Malachi and it is verified by the apostle Peter. Time is relative to the observer. As an object accelerates, time slows down relative to that object. Time and speed come together at - you guessed it - the speed of light. This is to say that a person riding a beam of light would be frozen in time - relative to everyone else, he could travel for several million years without aging a single second. To himself (since, relative to himself, he will always be stationary) time appears normal - it's just that the rest of the universe seems to be aging infinitely quickly! Psalms 90:1-4 [[A Prayer of Moses the man of God.]] Lord, thou hast been our dwelling place in all generations. Before the mountains were brought forth, or ever thou hadst formed the earth and the world, even from everlasting to everlasting, thou [art] God. Thou turnest man to destruction; and sayest, Return, ye children of men. For a thousand years in thy sight [are but] as yesterday when it is past, and [as] a watch in the night. Malachi 3:6 For I [am] the LORD, I change not; therefore ye sons of Jacob are not consumed. 2 Peter 3:8 But, beloved, be not ignorant of this one thing, that one day [is] with the Lord as a thousand years, and a thousand years as one day. Daniel 2:22 He revealeth the deep and secret things: he knoweth what [is] in the darkness, and the light dwelleth with him. James 1:17-18 Every good gift and every perfect gift is from above, and cometh down from the Father of lights, with whom is no variableness, neither shadow of turning. Of his own will begat he us with the word of truth, that we should be a kind of firstfruits of his creatures. Philippians 2:15-16 That ye may be blameless and harmless, the sons of God, without rebuke, in the midst of a crooked and perverse nation, among whom ye shine as lights in the world; Holding forth the word of life; that I may rejoice in the day of Christ, that I have not run in vain, neither laboured in vain. Matthew 6:22-23 The light of the body is the eye: if therefore thine eye be single, thy whole body shall be full of light. But if thine eye be evil, thy whole body shall be full of darkness. If therefore the light that is in thee be darkness, how great [is] that darkness! Matthew 10:27 What I tell you in darkness, [that] speak ye in light: and what ye hear in the ear, [that] preach ye upon the housetops. Accept the challenge today to move from inactive passivity and ignorance of His Word, to accomplish and do all that you're purposed to pursue. Don't allow yourself to continue to be submissive to the teaching of men and their outside influences. Instead let the declaration of your mouth and your action confirm the covenant of our God who is responsive to and responsible for His Word. Psalms 97:10-12 Ye that love the LORD, hate evil: he preserveth the souls of his saints; he delivereth them out of the hand of the wicked. Light is sown for the righteous, and gladness for the upright in heart. Rejoice in the LORD, ye righteous; and give thanks at the remembrance of his holiness. Genesis 1:16 And God made two great lights; the greater light to rule the day, and the lesser light to rule the night: [he made] the stars also. Psalms 104:19 He appointed the moon for seasons: the sun knoweth his going down. Psalms 136:7-9 To him that made great lights: for his mercy [endureth] for ever: The sun to rule by day: for his mercy [endureth] for ever: The moon and stars to rule by night: for his mercy [endureth] for ever. Proverbs 6:23 For the commandment is a lamp; and the law (Torah) is light; and reproofs of instruction are the way of life. Believers are destined by God to be a light unto the nations and the Menorah is a wonderful and beautiful symbol of His light. According to the U.S. Department of energy there are several ways to think of light: "The classical description says light is an electro-magnetic wave. This means that it is a varying electric and magnetic field, which spreads out or propagates from one place to another. The modern quantum mechanical description says that light can also be considered to be particles called photons. These carry energy and momentum but have no mass. In both descriptions, the light energy is carried by a very real and observable mechanism. But it is not a physical substance." Unseen light is of a wavelength that our eyes can not perceive. Does that remind you of anything? God is light, yet He is unseen. In the classical theory, light consists of an oscillating electric field and a magnetic field. Because light (electromagnetic wave) consists of electric and magnetic fields, when meeting such a charged particle as an electron, it exerts a force on the particle and there occurs an interaction between them. Very interesting, light exists but it is not a substance. Once again, sounds just like the spirit of God - - huh? Light has no mass yet moves like a wave, much like sound yet it is comprised of quanta particles and it exerts force yet it operates outside of the realm of natural and physical laws as time ceases at the smallest quantum level. The mystery of the particle-wave duality has been resolved with quantum mechanics. Quantum mechanics successfully describes the invisible sub-atomic and atomic world and it is the most fundamental theory to govern the microscopic world as well. Light's particle-wave duality is the very thing that can make it possible to explain the structure of atoms; not only the stability of atoms but also the atomic spectra characteristic to individual atoms. Light's electromagnetic energy is what holds quanta particles together, therefore quantum mechanics tells us that no matter can exist without light and all matter exists of invisible particles. Quantum entanglement is a property the quantum mechanical state of particles in which particles are linked together so that they are all reliant on their counterpart irrespective of the distance and space between the particles. Any question as to why God created light before He created the sun, the stars or the earth? Genesis 1:2-3 And the earth was without form, and void; and darkness [was] upon the face of the deep. And the Spirit of God moved upon the face of the waters. And God said, Let there be light: and there was light. Habakkuk 3:4 And [his] brightness was as the light; he had horns [coming] out of his hand: and there [was] the hiding of his power. Colossians 1:16-17 For by him were all things created, that are in heaven, and that are in earth, visible and invisible, whether [they be] thrones, or dominions, or principalities, or powers: all things were created by him, and for him: And he is before all things, and by him all things consist. According to the Rabbi's of the middle ages - The Light of God's Glory is linked to Messiah. "Whose is this light which falls upon the congregation of the Lord?" and answers,"It is the light of the Messiah." Remember, this about light. Many of the things in the physical, natural world parallel the spiritual and intertwine with it. Consider the numerous diseases like rickets that ravage the human body when it is deprived of life giving light. A study from the University of Maine explains that teenage girls are not getting enough vitamin D. As a result, they are at risk for disorders and diseases caused by the nutritional deficiency of low light absorption, including osteoporosis and possibly even cancer and high blood pressure. The cause? A lack of Vitamin D3 from exposure to sunlight. So don't continue living in the shade or in darkness, don't live outside God's teaching and instruction, if your do it will eventually mean death. Walk in the light of life, God's unchanging Word. The key to understanding God's light is to understand God gives us His teaching and instruction for living because He loves us. He never changes His mind and He teaches us some very simple guidelines about how we are to live. It's the original message of the Deceiver to fall for the idea that God does not mean what He says or that He changes His mind. Don't listen to that message any longer. To walk in His light we must "do" His word. It means that it is now time for you to repent and return to God's covenant. Return to hear and do His word and walk in the faith of His Kingdom path so that you can ready your lamp for your coming assignment. God is a sovereign God. He is a loving God and He has provided a way to offer you His "light" of salvation through Jesus, Messiah Yeshua. You can accept His gift of life. Consider carefully what your life consists of, look at it and repent of your sin, ask His forgiveness and accept His gift of love through Yeshua of Nazareth. Do it now! Follow Him. "Imperial physicists have discovered how to create matter from light - a feat thought impossible when the idea was first theorised 80 years ago. In just one day over several cups of coffee in a tiny office in Imperial’s Blackett Physics Laboratory, three physicists worked out a relatively simple way to physically prove a theory first devised by scientists Breit and Wheeler in 1934. Breit and Wheeler suggested that it should be possible to turn light into matter by smashing together only two particles of light (photons), to create an electron and a positron – the simplest method of turning light into matter ever predicted. The calculation was found to be theoretically sound but Breit and Wheeler said that they never expected anybody to physically demonstrate their prediction. It has never been observed in the laboratory and past experiments to test it have required the addition of massive high-energy particles. The new research, published in Nature Photonics, shows for the first time how Breit and Wheeler’s theory could be proven in practice. This ‘photon-photon collider’, which would convert light directly into matter using technology that is already available, would be a new type of high-energy physics experiment. This experiment would recreate a process that was important in the first 100 seconds of the universe and that is also seen in gamma ray bursts, which are the biggest explosions in the universe and one of physics’ greatest unsolved mysteries." Update March 15, 2012: NASA can now gives us a few at the very end of the electromagnetic spectrum and they have now idea what they are now seeing thanks to NASA's Fermi Gamma-Ray Telescope. Excellent study. Great connections between light, the color spectrum, the menorah and Messiah. Very good. You are on the right path. There are more "sevens" that connect to this study. They also tell a story when laid out on a seven branched menorah. YHWH bless you. Thank you for your amazing insights! I have heard that E=MC2 is the formaula for the first letter of the Hebrew Alphabet - the Aleph. Can you direct me to any source material that might explain that?